Subject nations are semi-independent subordinate nations that surrender their economic, diplomatic and/or military power to another country in exchange for protection by their overlord. It is possible to see a subject's nation information by selecting the country icon on the subjects tab. The types of subject nations range from the primarily economic Trade company to the military-focused March. All subjects (except trade companies) have a liberty desire that determines their loyalty towards their liege. Vassals are the most basic form of subject nations. They are required to pay a portion of their tax income to their overlord but do not transfer trade power to their overlord like other particular subject types unless the overlord is a merchant republic. While vassals may have control over their own territory and military, they also automatically join any conflict their overlord enters into. Vassalization can occur militarily by forcing it upon a defeated enemy in a war. Diplomatic vassalage can occur if a military alliance exists and relations are high (above 190). Vassals cannot declare war, and fabricate claims that either they or their overlord deems as 'Vital Interest'. Vassals with over 50% liberty desire can request a support of independence from other nations, and break free through an independence war. Vassals with over 50% liberty desire are also more active diplomatically as to forming their own alliances and setting more provinces as those of interest. After a nation has been a vassal of another country for at least ten years, their overlord can begin diplomatically integrating them into the overlord's domain. This results in the vassal's annexation. A march is a militaristic vassal that cannot be annexed and does not pay taxes to the overlord, but has lower liberty desire and gets significant bonuses to its armed forces. Marches receive increased land and naval force limits, manpower and manpower recovery speed, and fort defensiveness, while also gaining decreased fort maintenance. March status can be revoked and the subject turned into a simple vassal but at the cost of stability and relations loss. Client states are highly loyal, custom vassals. They can be formed once a country reaches diplomatic tech level 23 from any province or provinces that the player has control over. Generally, any province within two tiles by land can be added to a client state, including over straits. The first province that a new client state is given is automatically designated as the capital, and the culture in that province will become the primary culture of the new client state. The client state will have its creator's state religion. It is possible to customize the flag and the name of a client state based on a set of flag templates and images. Junior partners in a personal union share the same ruler as that of the leading country. Like vassals, junior partners of a personal union will automatically go to war if their overlord does, but they do not have to provide their overlord with a percentage of their monthly income, and only get a small +10 relations boost with their overlord. The junior retains any subjects it had, except other unions, which the overlord inherits. Personal unions can occur when a ruler dies without a legal heir. In this case, if a royal marriage partner shares the same dynasty as the deceased ruler, it becomes the senior partner in a union. A succession war may erupt between rivals or valid partners. Additionally, a claim throne casus belli can be used on nations with a disputed succession (weak or no heir) of the same dynasty that the player has a royal marriage with. Personal union partners can be inherited or integrated provided the union has been stable for fifty years. Diplomatic integration annexes the junior partner at the cost of diplomatic monarch points. Inheritance automatically annexes the junior partner with no autonomy, but occurs only upon ruler death. The probability of inheritance increases with the senior partner's diplomatic reputation and stability and decreases with the junior partner's number of provinces. A personal union can end upon the death of the senior ruler when the junior partner has a negative opinion of its senior. If this occurs, the former senior partner will get a "Restoration of Union" casus belli on the former junior partner, allowing the union to be reinstated militarily. Some nations can get a "Restoration of Union" CB against countries that they never had a union with in the first place, such as Austria, which can receive this casus belli against Bohemia and Hungary as a mission. Only nations that have one of the Christian denominations as their state religion are able to form personal unions. Colonial nations represent the distant New World colonial territories of European powers. They will automatically form once five cored colonial provinces exist inside a single colonial region. Once formed, colonial nations will take control of any province that would otherwise be owned by their overlord in a given colonial region, even if the province is uncored or would otherwise cause extreme overextension. Colonial nations pay a portion of their tax income to their overlord, based on the tariff efficiency. Additionally, colonial nations transfer 50% of their trade power to the overlord. When created, the colonial nation's flag is generated based on the mother country's flag and the colonial region the new Colonial Nation is located in. For example, a nation in the Mexico colonial region will have a yellow flag, while one in the Eastern North America colonial region will have a light-blue one. A trade company is a collection of overseas provinces that exchanges tax and manpower for trade, maritime and production benefits. 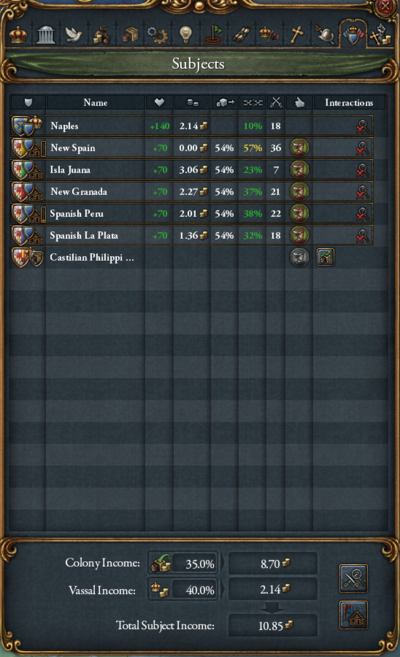 A province in a trade company provides approximately half the income, no manpower, and no sailors to the home country but produces double the trade power and adds 0.5 naval force limit. Additionally, the local autonomy floor is set to 0%, goods produced remains unaffected by cultural intolerance, religious intolerance is ignored, and the province does not contribute to religious unity. Trade companies may be formed by nations that own at least one province in any of the 15 trade company regions scattered throughout Africa and Asia. They differ from colonial nations in the Americas and Australia in that they are not separate governments, as all territories remain part of the mother country. Provinces in trade company must belong to a territory - adding them to a state will automatically remove them from a trade company. Provinces can be added or removed from a trade company at any time. Only provinces on a different continent than the country's capital may be placed into trade companies. Tributaries are a loose form of subject relationship available to nations in the Eastern religion group, as well as to steppe hordes and the Emperor of China regardless of religion. Tributaries retain full diplomatic independence and may start wars and have subjects of their own. The overlord receives a call to arms if the tributary is attacked (unless if by another tributary of the same overlord), but does not have to accept. Each year, the overlord may demand a tribute of money, manpower, or any of the 3 types of monarch points. The tribute is paid annually on January 2. Tribute type demand must be selected before January 1. The default tribute is money. If the tributary pays the tribute, trust increases slightly; if it refuses, trust falls significantly. AI always pays tribute when Liberty Desire is below 50% and refuse otherwise. Either party may renounce the tributary status at will, unless they have a truce. The overlord gets a one-way five year truce with the former tributary, but the former tributary may attack the overlord immediately. Tributaries who renounce their status lose -1 stability; this can be circumvented by refusing tribute until the overlord breaks the agreement on their own. As part of the Emperor of China mechanics, the EoC loses Mandate for every neighbouring nation which is not a tributary. On the other hand, the EoC gains Mandate for every tributary it has. Also, if the Emperor loses the Mandate of Heaven, its tributaries will not be lost if the nation follows a religion in the Eastern religion group. For a tributary overlord, sending manpower to tributary subjects at war can often be the cheapest way to decrease liberty desire and maintain the more value tribute income in the form of monarch powers. It can thus be helpful to set large tributary countries as "special interest" (right-click on country flag in provincial interface) and receive notification for wars by these tributaries. For establishing tributary subject of AI nation, threatened attitude gives the most significant +100. (Strangely, friendly attitude does not give any modifier.) The attitude goes away at high opinion. Thus the optimal opinion with the threatened attitude is around 0. Player should avoid improving relation for too long in that case. Daimyo are a unique form of vassal for the shogun of Japan. They may ally with and fight other daimyo, but not foreign countries. They do not occupy a relation slot, and the shogun has several special vassal interactions for them. In previous versions of the game, technologically backward nations could be made protectorates, which exchanged a transfer of trade power and not being allowed other allies for protection from hostile nations and a discount on technology cost. They did not occupy a diplomatic relations slot. Protectorates were merged with regular vassals in patch 1.20. All subject nations have a liberty desire between 0 and 100, indicating their wish for independence. Below 50 a subject state is loyal: it pays taxes/tariffs to its liege and takes an active part in all wars. Above 50 liberty desire, a subject becomes disloyal, refusing to pay taxes while being unhelpful in wars by only defending its own territory. Disloyal subjects readily accept support for their independence from foreign nations and make alliances with each other, and may declare an independence war if they have sufficient strength. In rare cases, a disloyal subject may still have a Friendly attitude toward its overlord; this means it will not accept requests to support its independence or alliances from fellow subjects, but does not otherwise alter its behavior. At 100 liberty desire, a state is rebellious, and will, at least in theory, declare its independence at the slightest opportunity. The relative army size of the subject compared to its liege. There is +75 liberty desire for having 100% of the liege's forces, scaling proportionately (e.g. +37.5 at 50%). The combined strength of all vassals, marches, and client states is used for their liberty desire. Personal union partners, daimyos, and colonial nations only consider their individual strengths. Additionally, nations allied with or supporting the liberty of a subject nation will have their army strength added to that specific subject. Other subjects will not have their army strength increased, unless their independence is also supported. A base modifier depending on type of subject: −25 for client states, −15 for marches, +10 for Japanese daimyo; 0 for vassals, colonies and personal union partners. +0.25 per point of development for vassals, client states, and marches. +5 for each level the overlord's diplomatic technology is behind the subject's. −0.1 for each point of positive relations (max −20), +0.2 for each point of negative relations (max +40). −5 for a royal marriage. +10 subject nation is a Steppe nomads. −3 per point of diplomatic reputation. +1 per point of the overlord's war exhaustion for colonial nations. −50 if recently defeated in an independence war (decreasing over time). +0.2 for colonies, per point of the colonial nation's administrative efficiency. +0.2 for colonies, per point of tariff rate. −0.5 per granted province development (sum decreasing over time by 0.1 per month). −5 per each development point improved in subject's province (sum decreasing over time by 1 per year). All subject nations are listed in the subjects tab in country interface. Subject interactions require Common Sense DLC unless otherwise stated. Since tributaries don't exist without Mandate of Heaven DLC, that is also needed for them. Client states and daimyo are special kinds of vassal and so have the same interactions. Liberty Desire modifiers from most sources, such as events and province defections, decay at 0.1% per month. Toggled liberty desire modifiers (embargo rivals, support royalists, subsidize armies, divert trade, send officers) last until cancelled. Liberty desire from tariffs is permanent. It is possible for the overlord to construct buildings in the provinces of subjects, and (with Common Sense) to develop them to reduce their liberty desire. The more points are spent on the development, the more the subject's liberty desire will be reduced. However, base liberty desire increases with each point of development, so this is a short-term savings that may hurt you in the long run. A nation can set its subject's military focus to any of the following, which will determine how they behave in wars. If the subject has more than 50% liberty desire, they will always behave as though set to passive. No focus The subject will decide its own strategies. Supportive The subject will seek to attach to friendly armies. Aggressive The subject will be aggressive towards enemies, seeking battles in enemy territory. Passive This will make the subject stay with armies in their own territory, and defend there. Unless escaping a larger threat. Siege This will make the subject use its armies to siege down hostile fortresses and not seek any battles. ↑ See in /Europa Universalis IV/common/defines.lua: variables with TRIBUTE_BASE_. ↑ See in /Europa Universalis IV/common/defines.lua: DIPLOMATIC_ACTION_TRIBUTARY_ACCEPTANCE_PER_DEVELOPMENT. ↑ See in /Europa Universalis IV/common/defines.lua: DIPLOMATIC_ACTION_TRIBUTARY_EMPIRE_FACTOR. This page was last edited on 30 March 2019, at 08:22.